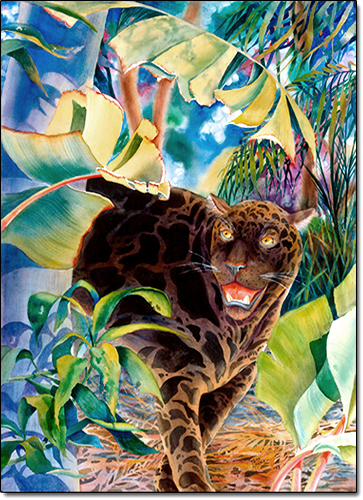 This watercolor painting shows you the interesting difference in the black jaguar's coat. When he is in the shadows, his coat appears to be black. As he steps into the sunlight, the tawny color and unique patterns in the fur appear. This painting is available as a poster. The artist hand signs each print before mailing. When you make your selection, click on the Add to Cart button to finish your purchase.